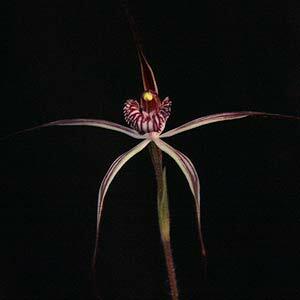 Some of the most remarkable of the Australian Orchids are the Caladenia Orchid species. Commonly called ‘Spider Orchids’ these are a terrestrial orchid some with flowers that do remind us of spiders. However within the genus, flower form does differ greatly. With nearly 200 species identified, the vast majority are from Western Australia. However some wonderful species are also found in the Eastern States. If you consider the intricacy of the flowers, along with great colours, Caladenia species stand up to some of the best in the world. They may lack size, however they are yet another beautiful Australian Orchid. Over the years a number of species from New South Wales and Victoria in particular have come close to extinction. Mainly due to urban development and grazing. C. concolor is one, found only in one reserve near Albury. A number of other species are also under threat. Caladenia are a terrestrial orchid and with such a wide spread distribution it is essential that you obtain growing notes from the nursery you purchase spider lilies from. Some species are pollinated by male Thynnid wasps, others by bees. Caladenia splendens is probably the largest flowering of the species. C. drummondii would be one of the smallest flowering. Caladenia polychroma or ‘Joseph’s Spider Orchid’ is very pretty species well worth looking for. C. concinna is found on the Southern Plains of NSW. C. magniclavata is from Western Australia. C. tentaculta is from South Australia and Victoria. 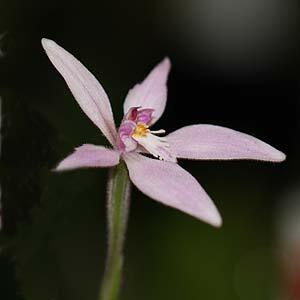 C. gracilis is commonly called the Musky Caladenia. C. pusilla is a diminutive species. C. catenata is commonly called White Fingers’. C. transitoria is the Eastern Bronze Caladenia. Many species that were naturally found in urban areas or areas widely used for agriculture are now endangered due to loss of habitat. Of the 80+ species most are found in Western Australia but some are spread across NSW and Victoria as well,.